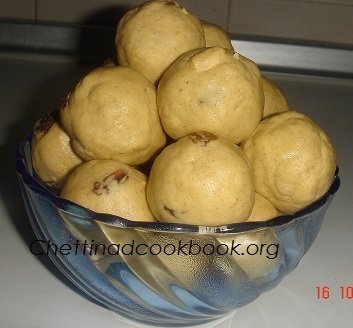 Healthy balls can be done in a few minutes with less effort and ingredients. This is known as “sathu urundai” in Tamil because we use protein rich dal flour mixed with pure ghee, Moong dal flour or fried channa dal flour can be used to make it yummy. In Andhra Pradesh, they do with fried urad dal flour. Only three ingredients used to make this delicious balls. Fry moong dal golden yellow and grind into fine powder. Sugar grind into fine powder, both powder in equal measures then sieve it together. Add Elaichi powder to it. Heat ghee in a heavy bottom pan, switch off the flame. Add these mix into it stir well in ghee. 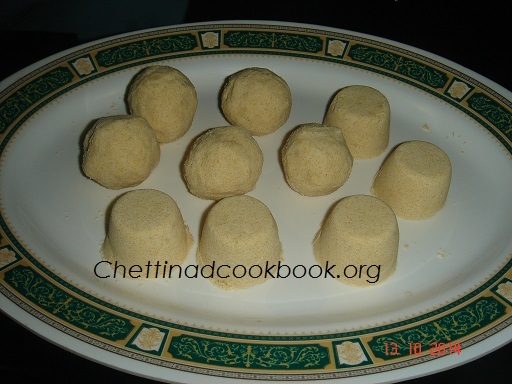 Make it into lemon sized balls or fill in mavurundai kinnam press it to get a different shape. This attracts the children to have more. Make your shapes by pressing tightly, when the mixture is warm, or heat it to get warm so that it will not get broken easily while eating. Add more ghee if you prefer.